This machine is currently in stock and available to hire today. 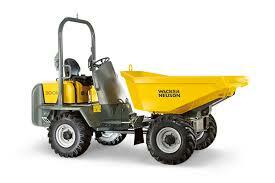 3 Ton Dumpers are great for moving materials or waste around a site. We now stock Swivel and also Straight tip dumpers, we are sure to have a dumper that suits your requirements. All of our 3 ton dumpers come with fold down roll over frames, amber beacons and green seat belt beacons that indicate that the seat belt is being worn. With a true 4x4 drive system and massive ground clearance and heavy duty off road tyres these machines can, and do often go anywhere. Transporting materials or waste around a site. Working on undulating and hard terrain due to the 4x4 drive system and oscillating front and rear axles. Partnering with a Mini Digger or 3 Ton Mini Digger. Available in Swivel Tip or Straight Tip variations. Highest stock levels in the Midlands. Newer Machines (most under 3 years old). Service records, training and expertise always available. We hire to all; domestic, commercial, public and private sector. Easy to quickly hire equipment. If you need help or would like to book a hire call now to speak to our team. No Account Required, No Deposit, No Insurance Needed. To book can take as little time as 5 minutes! 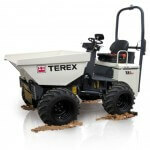 Why Terex and Wacker Neuson? Terex and Wacker Neuson are brand leading dumpers with excellent rugged 4x4 systems and loads of power for moving heavy loads. Many come with fold down roll bars to enable access to low ceiling environments and many are fully automatic hydrostatic clutches. Equipment is usually delivered by wagon, if you believe there are access restrictions that could cause difficulty for larger vehicles please let us know. All of our dumpers come with amber beacons and also green seat belt beacons which indicate when a seat belt is being worn. Dumpers are the perfect partner to Diggers. 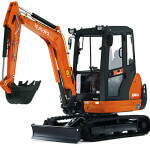 Get the job done quicker with a reliable and quality Kubota Mini Digger. Or request a call back below. Access requirements, extras or anything else? Our team of full time hire controllers is ready to answer your call immediately, answer our questions and arrange your hire instantly. We have a range of breakers which will save you time and energy, we are the only company in the UK to or knowledge that are prepared to fit breakers to our Micro Diggers. 3 Ton Diggers are a perfect partner to our 3 Ton Dumpers. Load the Dumper with a Kubota Mini Digger and make things quicker and easier. Vibration Plates, Mixers, Petrol Cut off Saws and Floor Saws can be added to your order. See our special offers to see what you could save when tagging on a small tool hire to a machine order! REMEMBER: Order your extras at the same time to combine delivery costs. Take advantage of our special offers and save! High Lift Dumpers are great for moving materials or waste, with a width of 114cm and a skip that lifts and discharges at a height of 1.85m they are able to discharge into skips and vehicles with ease. They are able to carry roughly a ton and have a skip volume of 540 litres. Equipped with 4 wheel drive, off road tyres and oscillating rear and front axles they truly are proper 4x4 vehicles. The Kubota KX61-3 has all the advantages of the Kubota Mini Digger - but comes in a bigger package, the added weight and power increases stability and productivity. Able to reach to a depth of 2.49m and weighing 2600KG; the machine can be towed behind many 4x4's and commercial vehicles.